Have you ever made fries with squash rather than potatoes? It’s so good, and they are a fun way to use seasonal produce during the fall and winter! You just need a butternut squash, avocado oil, smoked paprika, salt and pepper. That’s it! Five quick ingredients, and you’ll be on your way to enjoying a batch of delicious butternut squash fries. Ok, I’m not going to lie, this is the hardest part. Butternut squash is somewhat of an odd shape, and a little bit more challenging to manage than delicata squash or potatoes. Regardless, this little bit of effort is totally worth it! You’ll want to start by cutting your squash in half length wise, so you have two half bell shaped pieces. Then, use a Y shaped peeler to scrape the skin off, like if you would if you were peeling potatoes or carrots. Next, cut the butternut squash into long strips, slicing the squash from top to bottom lengthwise. Then, continue to cut the long strips into shorter strips until you end up with shoestring like fries. Try to get them relatively equal in size so they cook evenly in your oven. 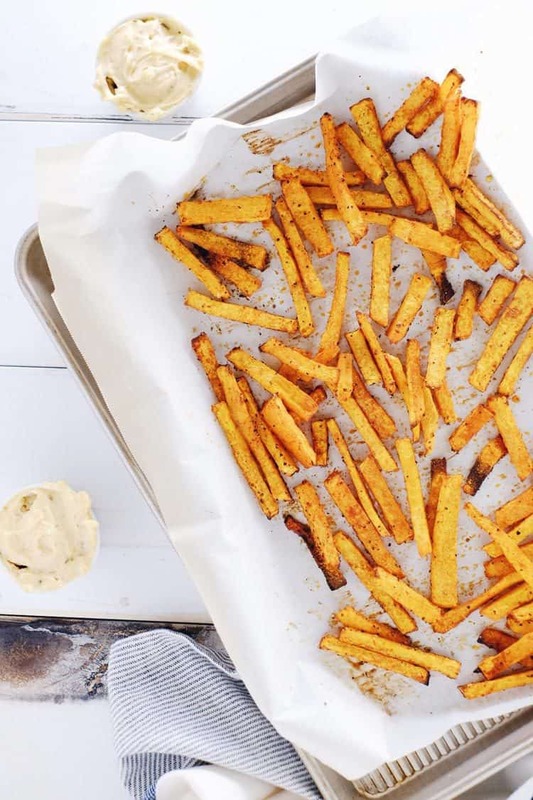 Once your butternut squash fries are all cut, place them in a large mixing bowl and combine with avocado oil, smoked paprika, salt and pepper. That’s really it. The smoked paprika does all the heavy lifting when it comes to producing flavor, and it pairs wonderfully with the mild and slightly sweet butternut squash. 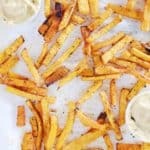 We love the way the simple flavors make these butternut squash fries perfect for dipping into all your favorite sauces. 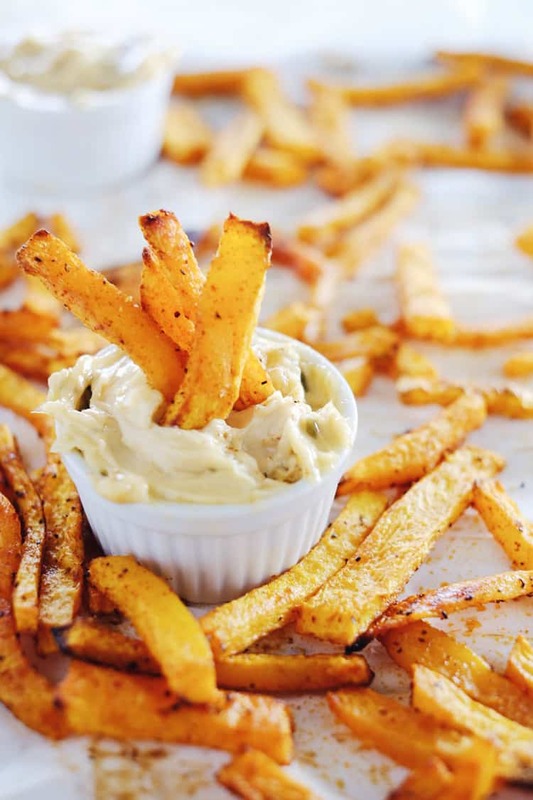 Some great sauce ideas are Primal Kitchen’s chipotle lime mayo and homemade honey mustard sauce. For the best results, try to get your strips or fries as similar in size and shape as possible for even cooking. Then, use a baking sheet large enough, allowing you to spread out the fries in a single, even layer. Cooking time may vary oven to oven. At 400 degrees fahrenheit, it should take 35-45 minutes. You want to cook them long enough that some pieces get a little charred and the edges get crispy. The centers will stay a little soft, which is just the way I like it! 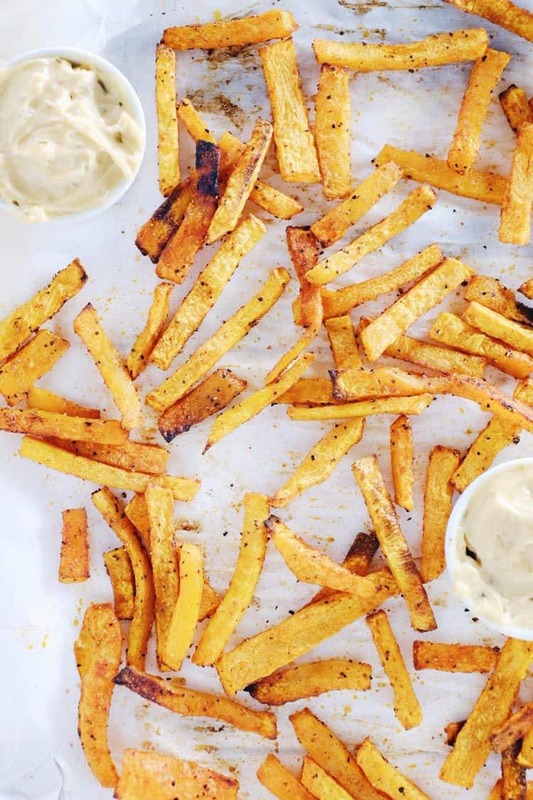 Ok, get ready to have a new preferred fry, and make our butternut squash fries. They go perfectly with all your favorite proteins and sauces. Let us know how it goes by leaving a comment below, and then take a photo. Tag us on Instagram @realsimplegood, so we can check it out! Start by lining a baking sheet with parchment paper, and preheat your oven to 400 degrees fahrenheit. Cut the ends off your butternut squash, and then cut it in half length wise. Use a Y shaped peeler to peel the skin off. Cut the halves into long thin strips, slicing from top to bottom. Then, cut the strips shorter until you have shoestring like fries. Place in a large mixing bowl. Add your avocado oil, smoked paprika, salt and pepper to your bowl. Toss to coat. Then, spread the fries out evenly on your parchment lined baking sheet. Place in the oven and cook for 35-45 minutes until they start to brown and the edges get crispy. Remove about halfway through cooking and toss fries around before putting back into oven to finish cooking. Once done remove from the oven. Serve hot, and dip in favorite sauces. I never thought of making fries out of squash, this is genius! I wonder if you could make these fries in an airfryer?